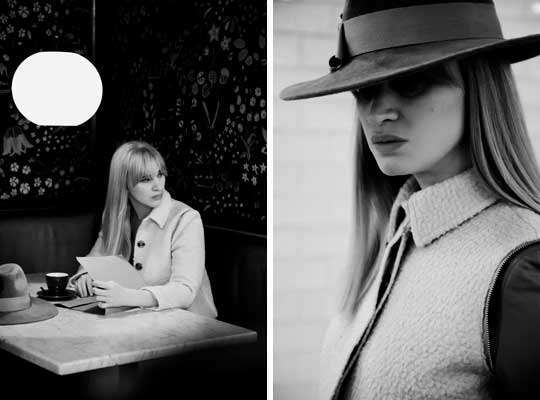 The Mes Dames Autumn/Winter 2013 collection is littered with stylish wide-brimmed hats and monochromatic designs. Mes Dames is a chic Swedish label designed by Lisa Wikander. It is a merge between Nordic aesthetics and the sensual aspects of French fashion. The autumn/winter collection is delicate, structured and full of power pieces for women. The seductive series was inspired by World War II secret service agent Christine Granville. The looks are meant to embody the energy of a young, strong woman while maintaining a sense of mystery. Must-have garments include neutral wide-leg pantaloons, sleek black long-sleeve tees, beige high-collar vests and slim-fit evening coats. The hats from the collection are the real showstoppers and are both flattering and flirtatious. The Mes Dames Autumn/Winter 2013 collection is a sophisticated debut and does its muse proud.